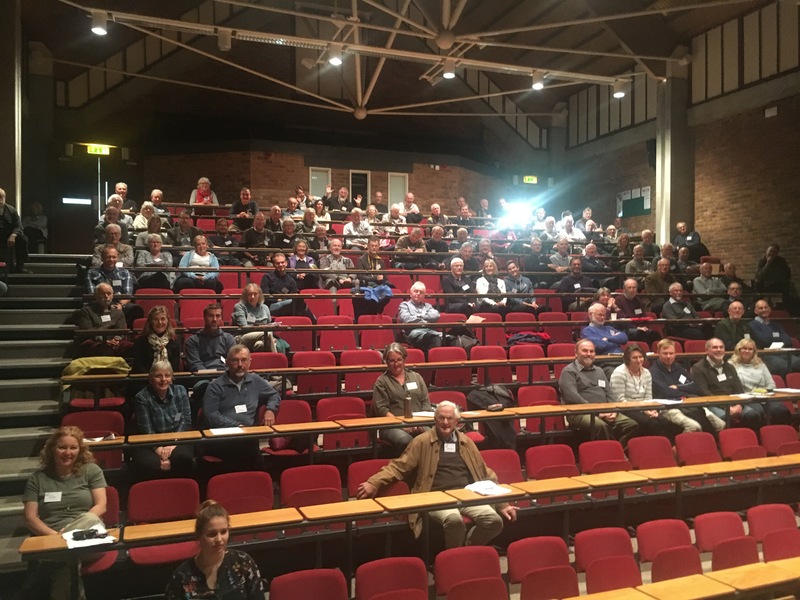 I spoke at the Kent Ornithological Society’s conference in Canterbury on Saturday. I’d like to thank the organisers for inviting me and laying on a great day for us all. The road to Canterbury passes too close to Rainham Marshes to ignore them (and a Cattle Egret or two), and too close to Gravesend not to stop and look for a Beluga (no luck) , and then too close to Capel Fleet not to stop and see c15 Marsh Harriers coming in to roost. And the road back from Canterbury on Sunday passed too close to the White-billed Diver off Margate not to go and see it (eventually) and then too close to Oare Marshes not to have a look (lots of Blackwits), and indeed too close to Graveney Marshes not to have a quick look at them. I was paid two ultimate compliments: having a heckler (not the first time) and generating a comment to the organisers about the “masterstroke of having a full blown Corbinista (sic) as the finale!”. It was a very warm and friendly audience and I’m grateful that they didn’t all leave to search for the White-billed Diver, and grateful to it for staying until the next day at least! If I had visited Capel Fleet 30 years ago I’d have been more likely to see a Hen Harrier, and less likely to have seen a Marsh Harrier. It was striking that a show of hands was overwhelmingly in favour of the view that wintering Hen Harriers are much thinner on the ground these days than in the past. This is hardly surprising when so many of them, including birds reared in Scotland, ‘disappear’ ‘mysteriously’ on grouse moors in northern England and the English breeding population is now so low (and often unproductive). I’m relieved to see, now I check, that one of the few ringing recoveries of a foreign-ringed Hen Harrier in the UK was indeed a bird found illegally killed (poisoned, actually) in Kent (Deal, actually) a long time ago (the 1962/63 winter, actually)(see page 17 in Inglorious). Copies of Inglorious were selling like hot cakes at the end of the day and several people took away copies of Remarkable Birds too. A good half a dozen people said they would write to their MPs (and I wonder whether they have…?). A great crowd and a fun day – thank you for having me. Maybe Jeremy Corbyn next year? Thanks for the inspiring talk. Having previously read your book, 'Inglorious' I enjoyed the talk thoroughly on both its own merits and as a kind of recap. Pleased we stayed to listen; particularly as we caught up with the first county twitchable White-billed Diver the following day. Wintering Hen Harriers have definitely become scarcer on the Somerset Levels over the last 10-15 years and as you say given the circumstances that is hardly surprising. However, it does seem that there has been a slight increase in reports ( from very very low to very low) so far this Autumn so maybe there is a very small change for the better. Trevor - I remember thinking when I was at school that surely hen Harriers would get quite common on The Levels over time (because the population was on an 'up' then thanks to afforestation).